March 6-7, 2010: Providence Pet Expo at the RI Convention Center One Sabin St., Providence, RI 02903. Show hours are 11am-6pm on March 6 & 7. Stop by and meeet Joy, Otis and the other shilohs. 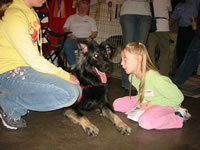 Joy will also be one of the demo dogs in the agility shows on both Sat & Sun. Hours are 11am-6pm local time, both days. Directions to the CT Expo Center, Hartford, CT, 265 Rev. Moody Overpass are as follows: I-91 Exit 33, Jennings Rd. Follow signs for the CT Expo Center to Meadows Music Theater. We will have lots of shilohs, lots of photos, and lots of printed information. We look forward to seeing many of our old friends and making lots of new friends. We will also be having a raffle on a great doggie basket looad with wonderful goodies! In addition we will be raising ,via donations, funds for the Excorine Pancreatic Insufficency-EPI-research project . 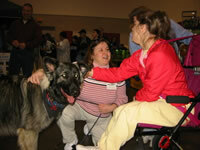 This project is currently underway at Texas A & M and affects all breeds of dogs. I would like to thank all of "you" for helping to make our presence known at the Providence Expo. Saturday was a gorgeous day here, but people turned out in great numbers to attend. On Saturday we had Kurgan with his entire family and also Hope with her entire family, and Manny "the man" with Sam & Terry and Joy with me and my friend , Auntie Diane, and we had the pleasure of Katy and Sasha. We passed out tons of tri folds and had kids galore petting our gentle giants. We had lots of handicapped adults and children in wheel chairs and not one of our fur babies were reluctant to be accommodating to whoever was approaching! Manny was selected to participate in a "parade" in a special ring by someone walking by. I believe this parade was to showcase the different breeds. I had to leave the expo for a couple hours midday to go pick up Kiora as she was having her final long distance date with Samson-what timing! On Sunday the weather was a bit overcast so the crowds were huge and nonstop. We had Hope with all her family and we had Brook with Sophia and the entire Clementi family who came from NY to help out :-)! Joy was also there to do her par, along with Katy and Sasha. There were no lulls at all and children were coming from every direction and pulling away from their parents to see the dogs and of course touch and pet them. We had tiny toddlers to seniors. Lots of wheel bound visitors. 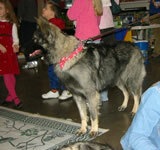 Our tri fold supply is almost depleted and many people thumbed through "The Shiloh Shepherd Story." It was great to pick up the book and show people along with answering the many questions. I had one K9 police officer stop by and spent quite a long time at the booth-he said he was known as "Dirty Harry" around the force! People were very impressed with our Shilohs Kurgan was a great asset as people were quite fascinated with the white shiloh and he is such a looker!! Several people had asked me for a Joy clone, again I think they were awestruck with the gray/black color. I think there will be lots and lots of people visiting the learning center this week! What I get asked the most is "How are they different from a GSD? "Many people will walk by and say those are GSDs, then they take a second look and then can't resist coming over to pet and then ask questions. 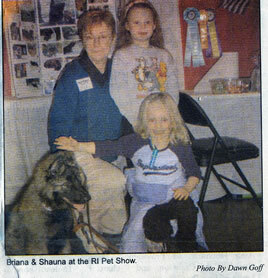 The SSONE Chapter sponsored a booth at the RI Pet Expo at the Rhode Island Convention Center. 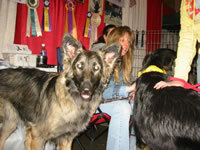 This year our booth had our "puppies" Hope, Manny, Brady, Brook, Joy and Thunder! 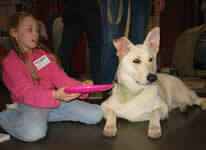 ered as a child with the personality of Lassie, Strongheart and Rin Tin Tin all rolled into one. For more information on the Shiloh visit their website at www.risingstarshilohs.com or email Sheila at sheila@risingstarshilohs.com or call (401) 647-3868."